The Tonight Show with Jay Leno is an American late-night talk show hosted by Jay Leno that first aired from May 25, 1992 to May 29, 2009, and resumed production on March 1, 2010 until its ending on February 6, 2014. The fourth incarnation of the Tonight Show franchise debuted on May 25, 1992, three days after Johnny Carson's retirement as host of the program. The program originated from NBC Studios in Burbank, California, and was broadcast Monday through Friday at 11:35 PM in the Eastern and Pacific time zones (10:35 PM Central/Mountain time). Unlike Carson or his predecessor Jack Paar, Leno only once used a guest host, preferring to host the series by himself. 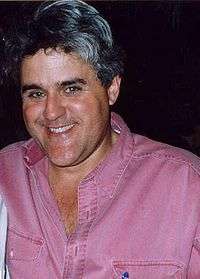 Neither O'Brien's version of the program, which premiered June 1, 2009, nor The Jay Leno Show generated the ratings NBC had expected. The network decided to move a condensed 30-minute version of Leno's show to O'Brien's time slot, and O'Brien's Tonight Show a half-hour later. This decision met with opposition from O'Brien, whose stint on The Tonight Show ended January 22, 2010, after which he began his own talk show on TBS. The Tonight Show with Jay Leno then began its second incarnation, the sixth of the franchise, on March 1, 2010. Leno left The Tonight Show for good on February 6, 2014 and on February 17, was succeeded by Late Night host Jimmy Fallon, at which time the series returned to New York for the first time since 1972. Leno himself would later appear on Jimmy Fallon's version of Tonight, such as a June 15, 2016 appearance in which Leno not only appeared as a guest, he delivered part of that night's monologue, commenting on the 2016 American election campaign. As the nightly broadcast approaches midnight, the first guest appears. The interview is divided into two segments, then followed by the fifth segment, which is the interview of the second guest. The sixth and final segment is almost always a musical performance, but occasionally, a stand-up comedian will perform instead. On August 22, 1994, Leno eulogized his father, who had recently died. After his monologue, Leno sat behind his desk and told the audience about his father's life and how his father had supported him in his career. Leno noted a moment when, upon Carson's disapproval at Leno being his successor, his father had encouraged him and told him to "'fight the good fight'". Leno ended the tribute saying, "You know, it really is lonely at the top. You have no idea. But... we'll fight the good fight, Pop." Following the attacks of September 11, 2001, The Tonight Show was off the air for about a week, as were most similar programs. The first post-9/11 episode began with a still image of an American flag and a subdued opening without the usual opening credits. Leno's monologue paid tribute to those who lost their lives and to firefighters, police and rescue workers across the US. Leno had questioned whether a show that regularly poked fun at the government could continue after the attacks, but in his monologue he explained that he saw the show as a respite from the grim news of the world, akin to a cookie or glass of lemonade handed to a firefighter. Senator John McCain and the musical group Crosby Stills and Nash were featured guests. Leno also organized an auction for a Harley-Davidson motorcycle signed by celebrities (he signed his name on-stage), with the proceeds going to 9/11 support organizations. For an extended period after the attack, a short clip of a large American flag waving was shown in between the announcement of the musical guest and Leno's introduction during the opening montage. On January 24, 2005, Leno had a special episode that paid tribute to Tonight Show predecessor Johnny Carson, who had died the day before. During the opening credits, the guests of that show were simply announced using pictures from when they were on Carson's Tonight Show, and the monologue simply gave condolence to Carson. There were no segments used, however, Leno played clips from The Tonight Show Starring Johnny Carson before commercials. All the guests were people who had worked with Carson or had been on his show, including Ed McMahon, Drew Carey, Don Rickles, and Bob Newhart. From 1991 to 2000 the cable channel Superstation showed both The Tonight Show and Late Show in daily bases, one week after airing in the USA. From 2011 the show is broadcast on Record News with Brazilian Portuguese subtitles at midnight (local time), two days after airing in USA. ↑ "The Tonight Show with Jay Leno Season 19 Episode February 10, 2011 'Rob Lowe / Amber Riley / Nicki Minaj' Preview | Paparazzi Journal". Paparazzijournal.com. ↑ Leno, Jay. "The Official Show Calendar". NBC.com. Archived from the original on March 4, 2010. ↑ Magazines, Hearst (September 1, 1999). "Popular Mechanics". Hearst Magazines – via Google Books. ↑ "O'Brien to replace Leno on 'The Tonight Show'". CNN. September 28, 2004. Retrieved March 16, 2010. ↑ "The Jay Leno Show". NBC.com. Retrieved August 13, 2009. 1 2 "Jay Leno Taking Over 10 pm On NBC". BroadcastingCable. ↑ Carter, Bill (December 9, 2008). "Where Is Leno Going? To Prime Time, on NBC". The New York Times. ↑ "Jay Leno Comes to Primetime on NBC". NBC. December 9, 2008. ↑ "Carson Feeds Letterman Lines". New York Post. Archived from the original on September 29, 2011. Retrieved December 17, 2006. ↑ "Leno promises smooth transition to O'Brien". MSNBC. September 28, 2004. Retrieved May 12, 2008. ↑ "O'Brien to replace Leno on 'The Tonight Show'". CNN. September 27, 2004. Retrieved May 25, 2010. ↑ Elber, Lynn (May 14, 2009). "Leno's last 'Tonight' guest is Conan O'Brien". The Buffalo News. Associated Press. Retrieved May 14, 2009. ↑ "Future For NBC's Tonight Show Up in the Air". Los Angeles Times. ↑ "Jay Leno Heading Back To Late Night, Conan O'Brien Weighing Options". Access Hollywood. ↑ Carter, Bill (January 24, 2010). "O'Brien Undone by His Media-Hopping Fans". The New York Times. Retrieved January 26, 2010. ↑ "Conan O'Brien: I Won't Do 'The Tonight Show' at 12:05AM". Zap2It.com. January 12, 2010. ↑ "NBC Dumps Conan for $45 Million Payoff; Reinstates Jay as 'Tonight Show' Host". TV Guide. January 21, 2010. ↑ "NBC Announces That Jay Leno Will Return To Host 'The Tonight Show' Beginning March 1". Tvbythenumbers.com. January 21, 2010. Retrieved August 10, 2010. ↑ "Stage Complex 9 & 11". The Burbank Studios. Retrieved February 7, 2014. ↑ "Kevin Eubanks set to leave The Tonight Show". The Tonight Show with Jay Leno. Archived from the original on June 2, 2013. Retrieved April 23, 2010. ↑ "Rickey Minor leaving 'Idol' for Leno's 'Tonight Show'". Los Angeles Times. April 13, 2010. Retrieved April 14, 2010. ↑ Levine, Stuart (July 1, 2010). "'Kimmel,' 'Nightline' show demo increase". Variety. ↑ Pike, Julie (September 7, 2010). "Tonight Show Ratings Plummet – Jay Leno Sinks Beneath Conan O'Brien Numbers". The National Ledger. Archived from the original on 2013-12-06. Retrieved October 4, 2010. ↑ Piccalo, Gina (October 24, 2010). "Comedians Laugh as Leno Sinks". The Daily Beast. 1 2 Poniewozik, James (November 5, 2010). "Letterman Defeats Leno! Stewart Defeats Both!". Time. 1 2 Hibberd, James (November 4, 2010). "Letterman Beats Leno in All Measures". The Hollywood Reporter. ↑ Collins, Scott (August 27, 2012). "'The Tonight Show' experiences dark days". Los Angeles Times. The NBC program starring Jay Leno suffers a ratings slide and layoffs amid instability in the TV business — and after network missteps. And the stakes are rising. ↑ Carter, Bill (March 21, 2013). "'Tonight,' With New Host, Set to Reclaim Its New York Roots". The New York Times. ↑ Finke, Nikki (May 13, 2013). "Late Night At NBC Upfronts: Jay Leno To "Pass The Baton" To Jimmy Fallon During Winter Olympics; Seth Meyers To Start Feb. 24". Deadline Hollywood. ↑ "Leno's Final Show Will Be Feb. 6". The Daily Beast. Retrieved August 12, 2013. ↑ "Jay Leno Returns to The Tonight Show to Tell a Few Monologue Jokes". YouTube. Retrieved November 1, 2016. 1 2 3 Block, Alex Ben (April 24, 2013). "Tonight Shows' NYC Move To Save NBC $20 Million in Tax Credits". The Hollywood Reporter. Retrieved February 7, 2014. ↑ "Branford Marsalis revealed he left 'The Tonight Show' because he wasn't going to play the role.". Highbeam Research. Retrieved January 17, 2013. ↑ "Kevin Eubanks to Leave 'Tonight Show'". CBS News. April 13, 2010. ↑ "Stern Rails Against Leno for Lifting 'Stuttering John'". Fox News Channel. February 24, 2004. ↑ "Stuttering John Melendez OUT as Jay Leno's 'Tonight Show' Announcer". Shabooty.com. July 22, 2009. ↑ Rosenberg, Howard (August 29, 1994). "Jay Leno's Eulogy Does His Dad Proud". Los Angeles Times. Retrieved December 15, 2014. ↑ Menon, Vinay (February 6, 2014). "Jay Leno's memorable Tonight Show moments". The Star. Retrieved December 15, 2014. ↑ "Nine Months star Hugh Grant runs talk show gauntlet". CNN. July 11, 1995. Retrieved February 24, 2007. ↑ "Leno's Stern Reaction Jay's Not Amused". Daily News. New York. December 2, 1995. ↑ "Stern Show News – Archive". MarksFriggin.com. ↑ Borowitz, Andy (May 13, 2003). "Interview With Andy Borowitz". CNN. Retrieved May 12, 2008. ↑ "Jay Leno's Tribute to Johnny Carson". Google. ↑ "Update: Colin Farrell Confronted On 'Tonight Show' Stage". Access Hollywood. Archived from the original on August 22, 2006. Retrieved July 24, 2006. ↑ Bonawitz, Amy (July 21, 2006). "Colin Farrell Gets Restraining Order". CBS News. Retrieved April 10, 2009. ↑ "Late shows return with Huckabee, Clinton". Associated Press via Muzi.com. January 3, 2008. Archived from the original on March 10, 2011. Retrieved January 15, 2009. ↑ "Huckabee, Obama have huge night in Iowa". CNN. January 4, 2008. Retrieved January 15, 2009. ↑ Mail Foreign Service (March 18, 2009). "Obama to make history with Leno as he becomes the first sitting president to appear on chat show". Daily Mail. London. Retrieved August 10, 2010. ↑ Leno, Jay. "Episode Guide". The Tonight Show with Jay Leno. NBC. Archived from the original on November 2, 2012. ↑ "Episode Guide". The Tonight Show with Jay Leno. NBC. ↑ "Inside Jay Leno's Teary, Guest-Filled 'Tonight Show' Goodbye". The Hollywood Reporter. June 2, 2014. ↑ "Leno says farewell to 'Tonight Show'". USA Today. July 2, 2014. ↑ "The Tonight Show with Jay Leno: Season 18". Metacritic. Retrieved June 3, 2012. ↑ Bianco, Robert (March 3, 2010). "Tuesday on 'Tonight Show': Palin pops in, Leno mails it in". USA Today. Retrieved June 3, 2012. ↑ "Awards for 'The Tonight Show with Jay Leno'". Internet Movie Database. ↑ "NBC soars as others stumble". MediaLifeMagazine.com. May 2002. Retrieved February 7, 2014. ↑ Hirschberg, Lynn. "Heeeeere's . . . Conan" The New York Times Magazine, May 20, 2009. ↑ "Leno's last 'Tonight Show' delivers record ratings". The Live Feed. May 30, 2009. Archived from the original on June 2, 2009. ↑ Levine, Stuart (July 1, 2010). "'Kimmel,' 'Nightline' show demo increase". Variety. Retrieved July 4, 2010. ↑ "Report: Summer ratings not so hot for Leno". CNN. September 3, 2010. Retrieved September 15, 2010. ↑ "For First Time in 15 Years, ABC's 'Nightline' Is No. 1 In Total Viewers in Late Night for 2009/2010 Season – Ratings". TVbytheNumbers. ↑ JAY LENO AND JIMMY FALLON FINISH No. 1 VS. ABC AND CBS COMPETITION IN THE MAY 2011 SWEEP NBCUniversal. June 3, 2011. Retrieved June 4, 2011. Archived December 3, 2013, at the Wayback Machine. ↑ Jay Leno and Jimmy Fallon Finish No. 1 vs. ABC and CBS Competition in the May 2011 Sweep The Futon Critic. June 3, 2011. Retrieved June 4, 2011. ↑ "Over 14-Million Viewers for Jay Leno's "Tonight Show" Swan Song". TVMediaInsights.com. Retrieved February 7, 2014. ↑ Dominic Patten. "'Tonight Show' Ratings — Jay Leno Farewell Hits 5-Year High – Deadline". Deadline. ↑ Lisa de Moraes. "Jay Leno Bows Out With Biggest 'Tonight Show' Ratings Week In Decades – Deadline". Deadline. ↑ Knox, David (June 29, 2010). "Comedy Channel drops Letterman, Fallon, Leno". tvtonight.com.au. Retrieved July 6, 2010. ↑ "Niente più Jay Leno su RaiSat Extra...". Antonio Genna. Retrieved May 12, 2008. ↑ "Jimmy Kimmel till Kanal 5". August 6, 2008.